NASA's Curiosity Mars rover used the Mars Hand Lens Imager (MAHLI) instrument on its robotic arm to illuminate and record this nighttime view of the sandstone rock target "Windjana." Image released May 15, 2014. NASA's Mars rover Curiosity is about to hit the road again. The 1-ton Curiosity rover has finished its drilling operations at a sandstone slab dubbed "Windjana," successfully delivering collected samples to its onboard scientific instruments for analysis. The robot will soon resume the long drive toward the base of Mount Sharp, which has long been its ultimate destination, mission officials said. The rover bored a 2.5-inch-deep (6.4 centimeters) hole into Windjana earlier this month, performing its third full sample-collecting drilling activity since touching down inside Mars' huge Gale Crater in August 2012. The previous two drilling operations, which investigated fine-grained mudstones at a site called Yellowknife Bay, allowed mission scientists to determine that the Red Planet could have supported microbial life billions of years ago. Yellowknife Bay is close to Curiosity's landing site. Windjana is about 2.5 miles (4 kilometers) southwest, on the way toward the foothills of Mount Sharp, which rises more than 3 miles (5 km) into the Martian sky from Gale Crater's center. This view from the Mars Hand Lens Imager (MAHLI) on NASA's Curiosity Mars Rover shows the rock target "Windjana" and its immediate surroundings after inspection of the site by the rover. 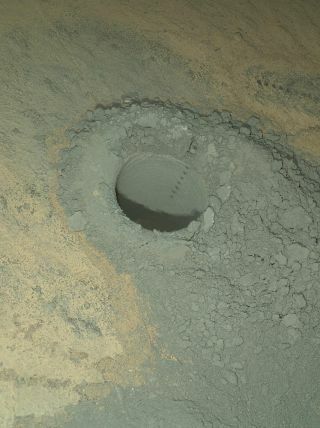 The drilling of a test hole and a sample collection hole produced the mounds of drill cuttings that are less red than the other visible surfaces. Image released May 15, 2014. Mission scientists want Curiosity to climb up through these foothills, reading a history of the Red Planet's changing environmental conditions as it goes. The rover's measurements could help shed light on why and when Mars changed from a relatively warm and wet planet to the cold and dry world we know today, NASA officials have said. Curiosity is exploring the Red Planet with the aid of 10 different scientific instruments. Two of the workhorses are the Chemistry and Mineralogy instrument (CheMin) and the Sample Analysis at Mars instrument (SAM), both of which sit on the rover's main body. CheMin and SAM will perform a detailed analysis of the Windjana samples, as they did for the powder collected at Yellowknife Bay. While Windjana powder has already been delivered to both CheMin and SAM, Curiosity carries still more of the material, which may be transferred to the instruments during pauses in the rover's driving if need be, NASA officials said.